Copyright, 1887, by Wm. McEwen. He tells her of the far-back time when he was young as she. And in her mind she wonders if he remembers, too. The man who lived in Noah's ark when this old world was new. You see the sunlight blending the silver and the gold. And now he clasps his darling as the day is getting dim. And both together murmur a simple evening hymn. His stalwart sons come round him. all well advanced in years. The childish prattle little May is whispering in his ear. Folks call the old man childish, it may be even so. But those who live in child-like faith, our Father calls his own. 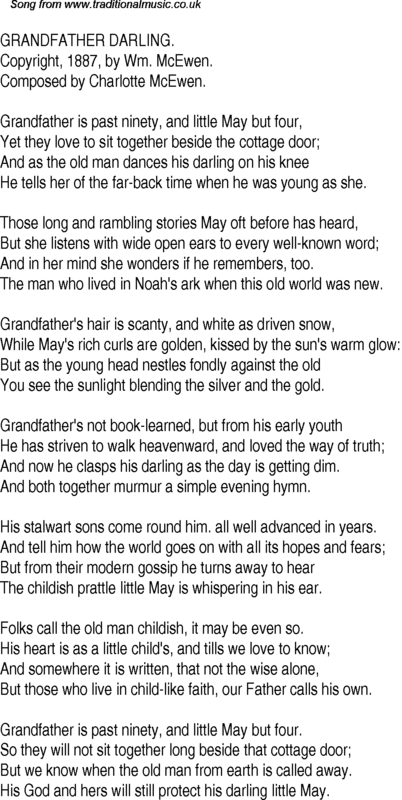 Grandfather is past ninety, and little May but four. But we know when the old man from earth is called away. His God and hers will still protect his darling little May.